At Impact Trophies & Medals, we offer a huge range of individual and annual shields & plaques suited to any badminton event or competition. 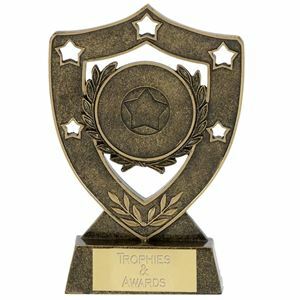 Our extensive range includes glass plaques, budget plastic awards and individual and annual wooden shields for badminton.. Impact Trophies & Medals are a leading retailer of badminton shields & plaques. Great for personalisation, many of our budget plastic plaques and premium crystal and wooden shields can be personalised with high quality text engraving and printed logo inserts, to perfectly meet all your badminton club presentation needs. Offering excellent value for money, this eye catching rectangular wooden plaque is made from a quality wood and can be personalised to suit the requirements of your event. The Phoenix Badminton Plaque is finished in a dark wood burnished effect veneer and bevelled edges. The smooth face of the plaque displays a circular round plastic disc, embossed with a detailed image of two golden badminton rackets and two white shuttlecocks against a silver background with white net and court markings. The sleek Maverick Apollo Badminton Plaque is made from premium mahogany veneered wood and has been finished with attractive bevelled edges. The bronze and gold motif is made from a quality plastic and features two detailed badminton rackets and a shuttlecock, highlighted in silver. There is space beneath the motif for a personalised text plate to be displayed.